This nine-piece wonder wears a lot of chef hats, from smoker to stock pot and everything in between. Nobody told this grill it could only cook on a grate. Wok, smoker, skillet, braiser, roaster, deep fryer, slow cooker, stock pot—the cast iron wonder wears a lot of chef hats. 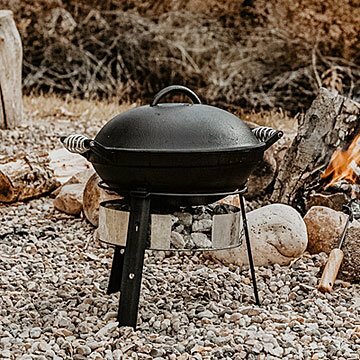 Plus, it packs together for easier transport, so you can have pancakes on the patio, chili at the tailgate, and stir fry with friends under the stars. Made in China. Since the beginning, Robert and his team have been working to use their goods, and a portion of the profits generated through them, to bring humanitarian relief to those in need. They’ve provided tents for shelter and to house clinics in the wake of earthquakes in Nepal and worked with rural villages to provide education and economic opportunities in Africa. They've also worked closer to home, partnering with nonprofit organizations to transform unused public land into a thriving community garden and orchard in Utah, where the company is based. Do not wash with soap. Dry after washing, and season with desired oil. This is a made-to-order item. If you order today your item will ship no later than 4/25/2019.